Our flat is filled with sparkling lights, rolls of wrapping paper, the smell of pine and the sound of Mariah Carey (don’t judge me, you know you’ll dance around your tree to this at least once before the year is out). I’m the proud owner of a brand new gingerbread man jumper (eat them, wear them, I’ll take any form of extra baked goods in my life). And everywhere I look (granted I’m looking at food blogs, food websites and cookery programmes on TV), it’s all about festive food. 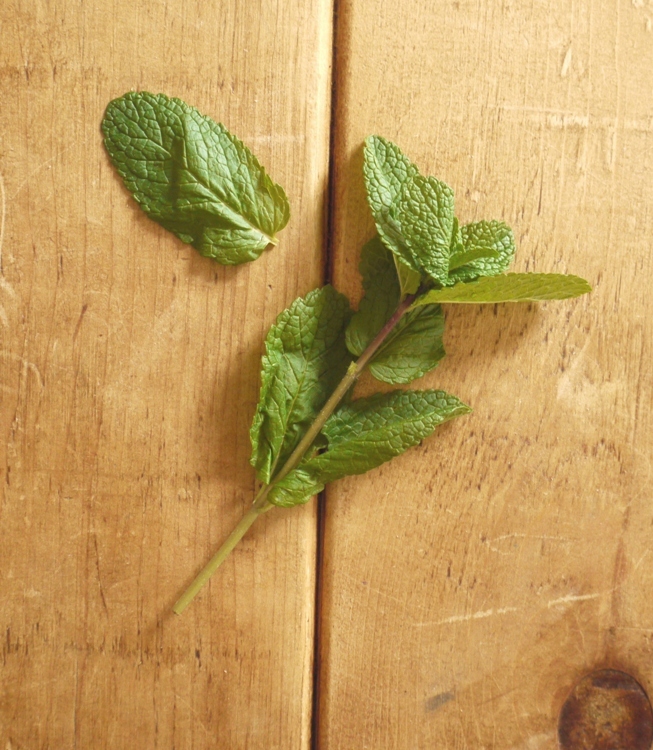 While the majority of recipes are rich with cinnamon and cloves, cranberries and brandy, mince pies, mulled wine and the like, there’s another Christmas ingredient with which keeps cropping up: peppermint. Over the last week I’ve been eyeing up peppermint ice cream, peppermint marshmallows and peppermint cookies: recipes packed with cool, bright, head-clearing flavour that feels like the antithesis of so much of the heavy food we eat at Christmas. The recipes I’ve linked to above use peppermint in the form of crushed up candy canes, but without any in the house and an immediate need (desire maybe, but it felt like a need) for mint ice cream, I decided to use fresh leaves instead. In fact all the ingredients are ones you’ll likely have in your store cupboard or garden: the kind of recipe you can make without even leaving the house, which is always a bonus at Christmas. This ice cream is smooth and white as snow, full of fresh mint flavour and, unintentionally, vegan (sort of, if you’re strict you might want to sub maple syrup for the honey here). Rather than fold in chocolate chips as I usually do with mint ice cream, I’ve added chocolate on top in the form of homemade magic shell and the contrast between crisp chocolate and smooth cream creates a sort of ice cream equivalent of to an After Eight Mint, hence the recipe title. 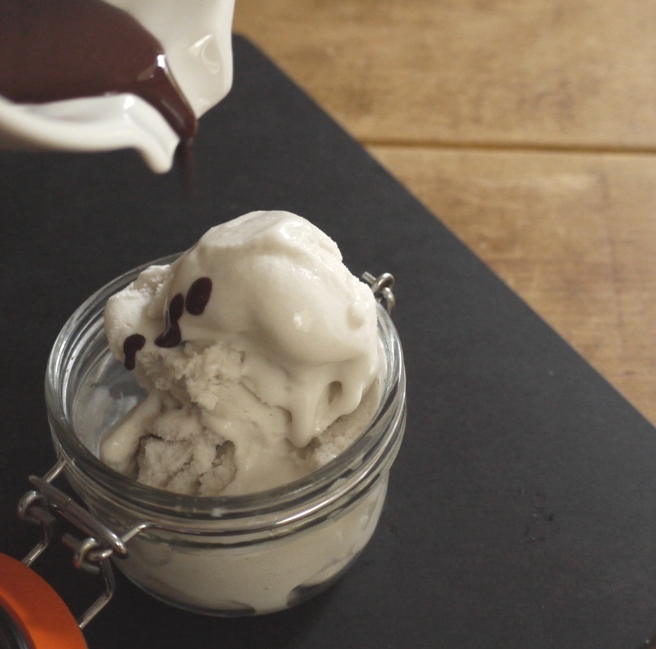 If Christmas is in full swing where you are, you might be looking for something slightly more indulgent than a simple vegan ice cream today. That’s fine, I can assure you there will be plenty of indulgence going on over here over the next couple of weeks too. But come Boxing Day, when you’re as stuffed as a turkey and craving the counterbalance of something just a little bit sweet, you might like to remember this recipe for a treat that is light, bright and still entirely Christmassy. Even more so with a few crushed candy canes on top. In a small bowl, whisk together one third of a can of coconut milk with the corn flour. In a medium saucepan, heat the remaining coconut milk and honey until the honey has dissolved. Whisk in the corn flour mixture then bring to the boil. Reduce the heat and simmer, whisking constantly, for 2 minutes. Remove from the heat, add the mint leaves and set aside to infuse for one hour. Strain the mixture into a container to remove the mint leaves then refrigerate overnight before churning according to your ice cream machine manufacturer’s instructions. 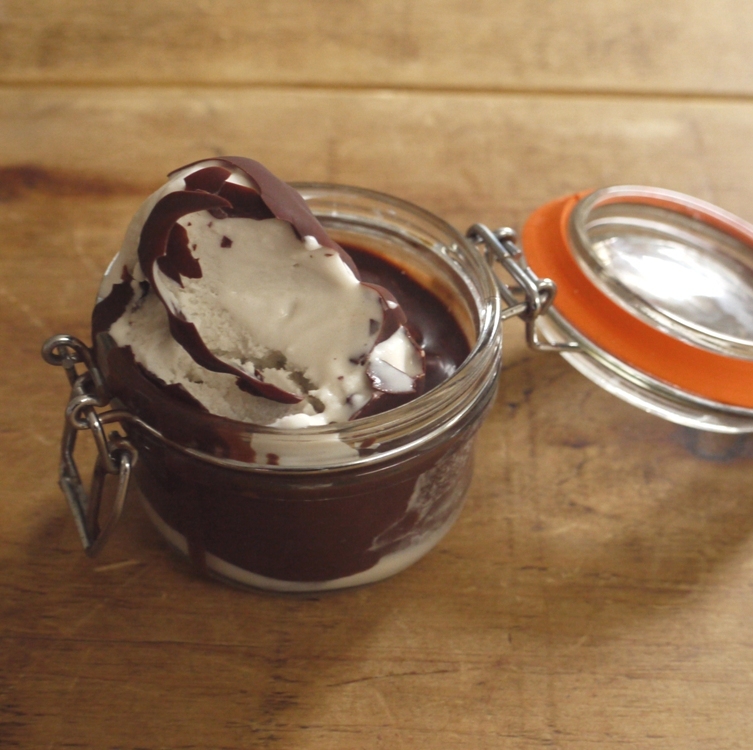 In a bowl suspended over a pan of simmering water, melt the chocolate and coconut oil, whisking to combine. Stir in the salt and peppermint extract, if using. Set aside to cool slightly before using or it will melt your ice cream. To serve, scoop the ice cream into bowls. 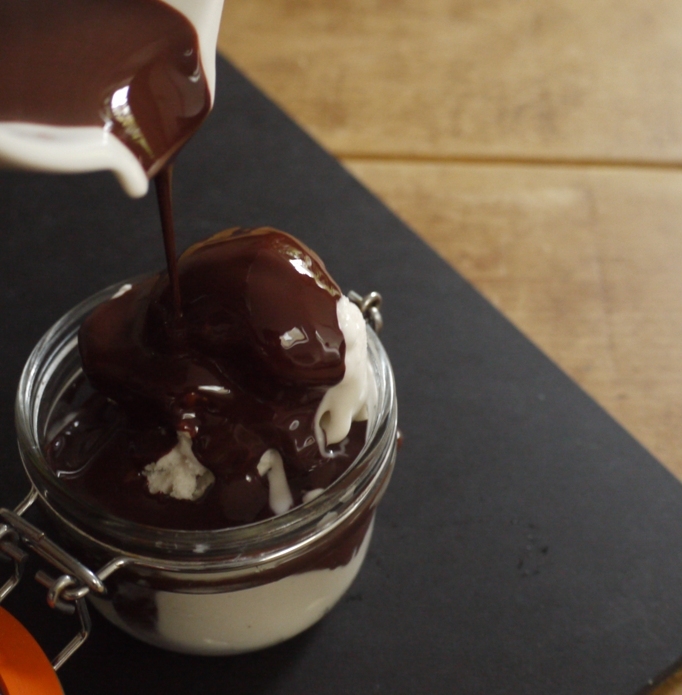 Pour over the chocolate sauce and wait a couple of minutes for the shell to harden. Crack with a spoon and enjoy. first off, thanks for the link to my site 🙂 second, this looks amazing. I’m from the states but living abroad in Zurich, and I’m constantly looking for mint + chocolate combinations, but it can’t be found here! I think I can handle making this magic shell to top over vanilla ice cream (my ice cream maker is sadly in storage)! My pleasure, those cookies look TOO good 🙂 Mint and chocolate is such a delicious combination and you can’t really taste the coconut too much here – it just makes the ice cream lovely and light and creamy. Oh this sounds so lovely! Can you come decorate my place? The only Christmas cheer is in my photo setups at this stage! I LOVE mint chocolate ice cream. In fact, I just made some too. This looks heavenly. Mmmm I love chocolate and mint together! The ‘magic shell’ is awesome idea too, keeps reminding me I must buy some coconut oil! 6 portions? forget that. I’m eating it all to myself. Growing up After Eight was one of the sweets I loathed the most – both my older brother and sister love it so somehow family friends and relatives assumed I loved it too, meaning boxes of After Eight were frequently given to all of us around the holidays (to me it always tasted like chocolate-covered toothpaste!). Now that I am older, I actually really like it – I think an old flatmate’s chocolate and candy cane bark converted me – although I have yet to try it in ice cream form. I happen to have an open can of coconut milk that needs using up asap … rather tempted to give this a try! I love magic shell so much…such a treat! I really need to get around to making my own at home! It’s so simple and, made with coconut oil, actually pretty good for you! 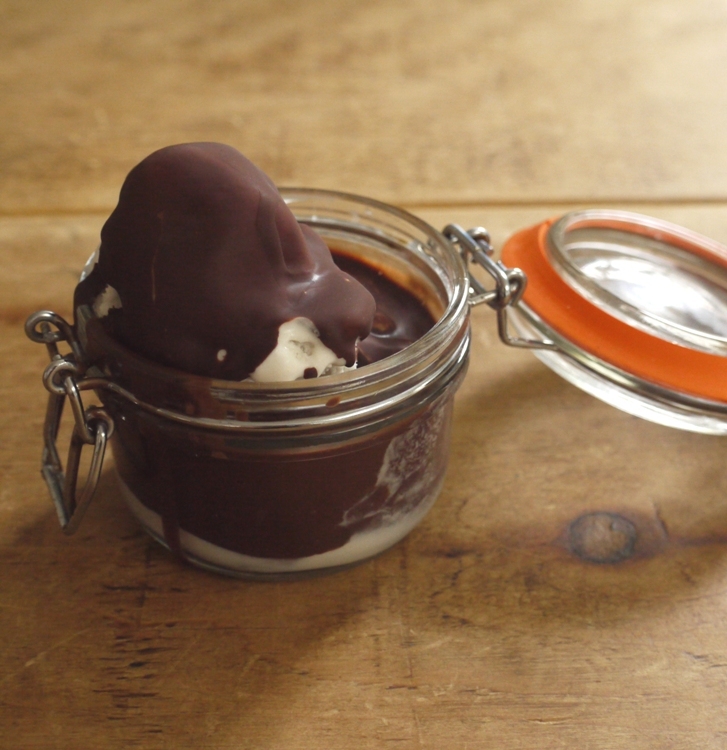 What a darling Kilner jar of ice cream! I love that you could assemble/scoop these well ahead of time and freeze them. . . just sauce to order and you’ve got a party! Great for time saving during the holidays! I love peppermint ice cream, especially with magic shell. 🙂 I love that it’s vegan too. You had me at the first picture – Yum!! I’m loving this, not only the peppermint ice cream but the Ice Magic(I think that’s what it was called when I used to go through a bottle at a time) what a lovely refreshing dessert to serve up at this time of year. Mint choc chip ice cream, one of my all time favorite flavors. Also ideal to cleanse the palate after a huge Christmas meal! It’s wonderfully palate cleansing with the cool, minty ice cream and crisp chocolate shell. I’m not really a fan of peppermint so fresh mint ice cream sounds far more delicious to me and you can never go wrong with some homemade magic shell! I used to love after eights! What a cute presentation in the canning jars too. This looks way better to me than the crunchy peppermint ice cream variety. The smoothness is very indulgent. Love this!!! I just HAVE to make this now. The chocolate shell makes me think of eating ice cream when I was little – we used to have that chocolate sauce in the squeez-y bottle that you squirt all over the ice cream and it goes hard. I used to think that it was magic. This looks much more upmarket, though – and far better for you… LOVE it! Gorgeous, gorgeous, gorgeous recipe. To this day I love after eight mints, so this is the perfect ice cream for me! It’s such a fabulous combination. And it’s ice cream, how can that be bad? And with the hot weather we’re having here, this would look great in my freezer. Have a great year Kate!